High in the Himalayan peaks and in the grasslands of Central Asia live a species of wild cats that are as mysterious as they are unbelievably adorable. With eyes that seem to stare into your soul and beautiful fur that is comparable to only a few other animals, it's difficult not to fall in love with this rare creature. 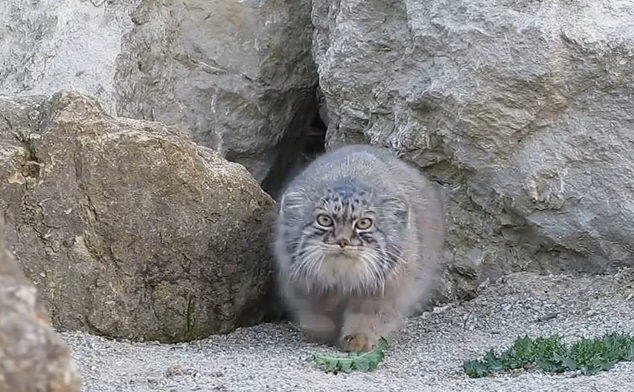 This creature is called the Pallas's cat. It's about the size of a domestic cat but the Pallas's cat seem to look much bigger because of its dense and thick fur. A camera trap set up at a rock boulder in the Himalayas was able to capture in vivid detail the appearance and movement of one Pallas cat. Taken by curiosity, the cat slowly emerged from its cave then quickly approached the camera and investigated it. The Pallas's cat was named after Peter Simon Pallas, a German zoologist and botanist who first described the species in 1776. The cats can be found in Mongolia, Kyrgyzstan, Kazakhstan, Tajikistan, Pakistan, Kashmir and across much of Western China. The Pallas's cat has been classified as "near threatened" by the International Union for Conservation of Nature (IUCN). The decline in the cat's population is mostly due to habitat degradation, hunting, and decrease in its prey base.